"There are stories about what happened…" Get ready! It's almost here. If there was a time when I'd say we're starting to see too much from Star Wars, this is it. This is the TV spot where it starts to feel like, you know what, better to save the rest of it for the movie theater in just about a month. This fourth TV spot for Star Wars: The Force Awakens, directed by J.J. Abrams, includes even more new footage showing another temple and an awesome shot of John Boyega in the Falcon, along with Daisy Ridley piloting it. 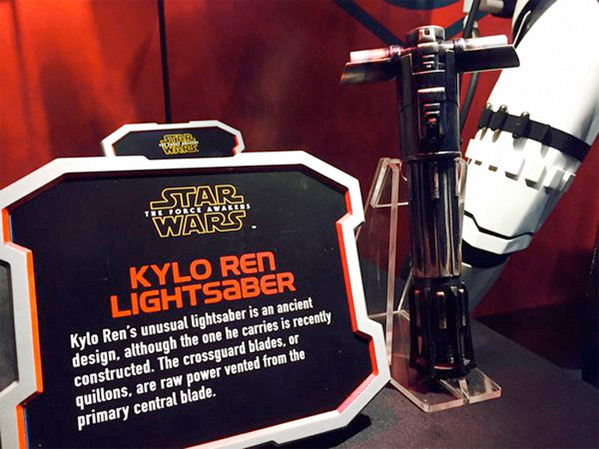 In addition, a photo was posted via Reddit of a display at Disneyland that describes the details behind the villain Kylo Ren's red lightsaber. This was a big argument for a while, and this kind of settles it. Have at it. To see the latest trailer for The Force Awakens, click here. For all of our latest Star Wars updates, go here. Ah, so people were exactly right about the Ren Lightsaber? Interesting. I don't understand how this film is not yet rated. Probably rated R for rapey use of The Force. Remember the last words in the final trailer? Sshhh.....just let it in, Capitan....it'll all be over soon. Maybe that's why they call it "The Force". Maybe they're still tinkering with editing? Final tweaks? Final scoring? Before submitting? Even the guy Daniel Fleetwood apparently saw an "unedited" version recently. It's going to be PG: Probably Gungans in it. The old Star Wars pen and paper RPG defined the lightsaber blade as a very tight parabola. This makes the concept of the quillions as just venting extra power from the main shaft a little silly. To me, it means you don't know how to control the force properly. It would be much cooler if the quillions were also parabolas and became shorter as more power was needed for the main shaft. This would give an indication of how much a force user was putting into lightsaber battle. This would also be why the old design was abandoned, one would want to hide how much force she were using. Lightsaber battles are just as much mind games as a real battle. That would be pretty cool if Ren couldn't figure out how to vent the power and just tricked out the lightsaber. That's a great idea. I'll start up the 'ol rumor machine! Is than even canon though? Dammit i the stronge urge to take my camping stuff and put it in front of the cinema entrance! If you read the latest Entertainment Weekly you'd know that this won't be completely finished until about 3 weeks before its release. Funny I cant find that issue anywhere. WTH? why? John William's score is....ummm... irreplaceable. no thanks. I never understood why the SW purist were moaning about the saber. It looks badass and that's all there's to it in my book.